Well, today has been a long, and very exciting day! The week started with me finally finishing my Five Coat, and ended with personal access to some unique costume items. 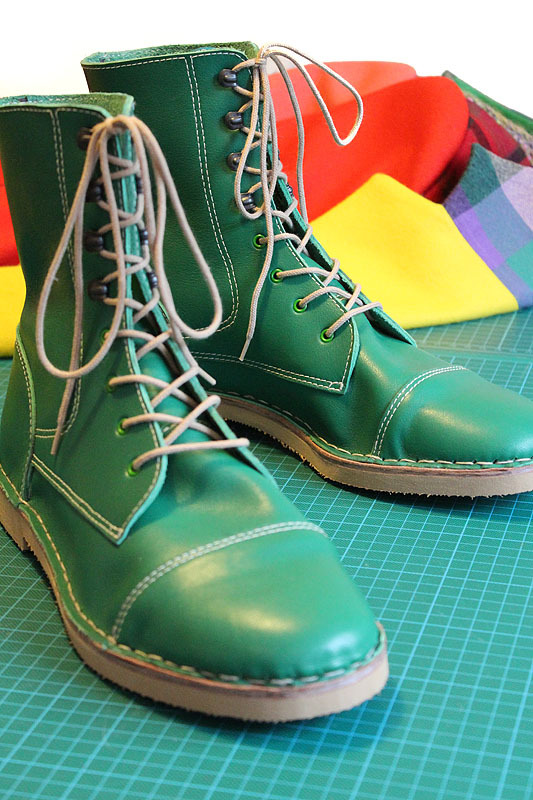 A friend who commissioned me to make him a pair of Five Trousers was interested in having his own Five Coat to go with it, but was keen to see mine before ordering one for himself. So I agreed he could visit so he can see it first-hand. During our conversations arranging this, it came apparent that he was more a fan of the Sixth Doctor and owned a number of screen-used original costume pieces worn by Colin Baker. Wow! I tentatively asked if he could bring them along so I could maybe get pattern traces, photographs and detail scans of fabrics for reference, with a view to making replicas. He was most agreeable. Game on! The pressure to get the Five Coat finished was on me two-fold: the sooner I could complete it, the sooner I could see the Six Costume. So, this weekend he came by and after inspecting my Five Coat (which he was suitably impressed with) we turned to his collection of Six Clothes. And what a list it is. Fantastic! 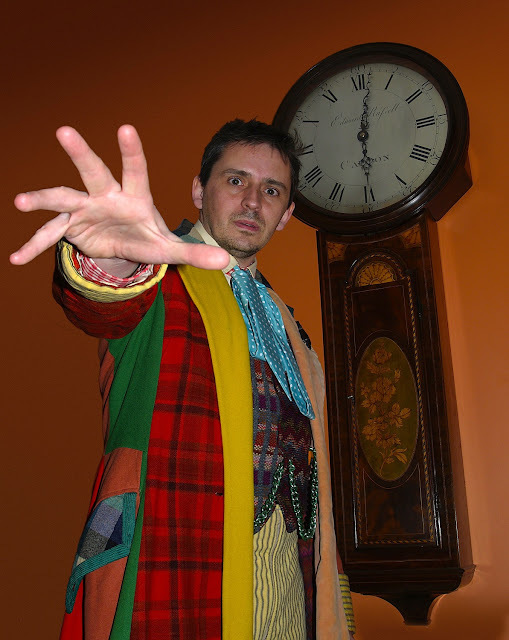 He has two original cravats: the red one from The Trial Of A Time Lord (see below, left) and the yellow with coloured stars as seen in Terror Of The Vervoids (see below, right). I was able to get a detailed trace of the pattern and good quality scans direct from the fabric which I intend to reproduce using Spoonflower. I also found they were not quite the same length as each other, and the yellow one had mis-matching ends, with the angle of the points being different (see right). 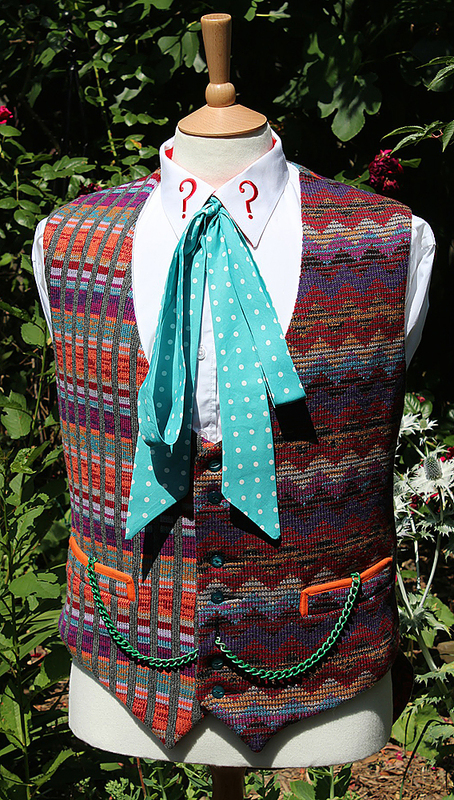 An example of each of the three waistcoats were in front of me: the original two-fabric woven version used from The Twin Dilemma to Revelation Of The Daleks (see below, left); the gingham-style checked one from The Mysterious Planet (see below, centre); and the purple striped version from Terror Of The Vervoids (see below, right). I also got to inspect one of the many gingham-flashed shirts (see left). 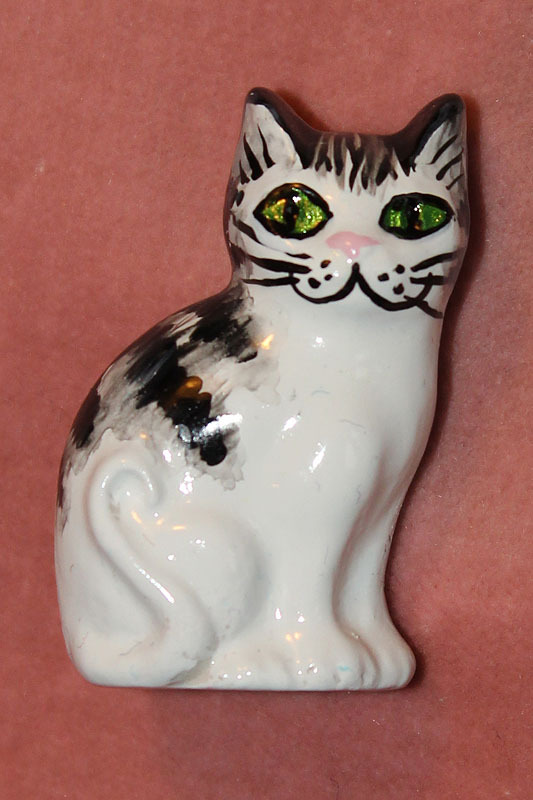 This one was quite yellowed with age, but was otherwise in near perfect condition. It was surprising how long the shirt is - it just seems to go on forever! There was also a pair of (I must say) enormous trousers, made from the identical yellow-dyed pillow ticking I had utilized when I made my own Six Trousers (see right). I also saw two pairs of orange spats: one were apparently used early on in The Doctor’s regeneration and were made from canvas; the others were used in a later season, and had been coated with latex, making them look like leather, though the surface had deteriorated somewhat. Finally, and the crowning glory of the collection, was one of the three original Frock Coats worn by The Doctor. For me this was an amazing opportunity to touch and feel an iconic garment, which I had made my own Six Coat at the time in 1985. I was pretty chuffed that my own coat stood up well against the real thing (see left), considering I had done it on a serious budget with limited resources. Despite being an horrendous clash of colours and textures, there is something quite stunning about this coat, and I found it full of surprises. For example, I had always thought that a narrow panel on the edge of the back split was a green tartan, but on close inspection it is actually a series of hand sewn panels of green and orange, attached with a white embroidery yarn (see right). Obviously it would be fantastic to match all of the dozen or so fabrics used on the coat. I did notice that there was a couple of colours that were in a heavy melton (a form of felt, commonly used for coats or under the collars of jackets). I had recently found a reliable source for meltons and had a swatch book they had sent me. To our collective surprise, there where THREE very good, near exact matches to fabrics! (see below). One is such a good match (the purple), you can hardly see the edge of the swatch next to the coat! I could also see that some of the other solid colour fabrics were very easy to source - it would be just down to the patterned and woven materials to overcome before thinking about making a replica . . . well, maybe another time. Finally, I could not let the opportunity pass me by not to wear the entire ensemble! All in all it was an unique chance to get as many notes, photographs, pattern traces and scans of fabric for reference. It took me eight hours to get it all done! The first thing I will look at making are the cravats, as they are quick and simple to reproduce - especially since we now have Spoonflower . . . . 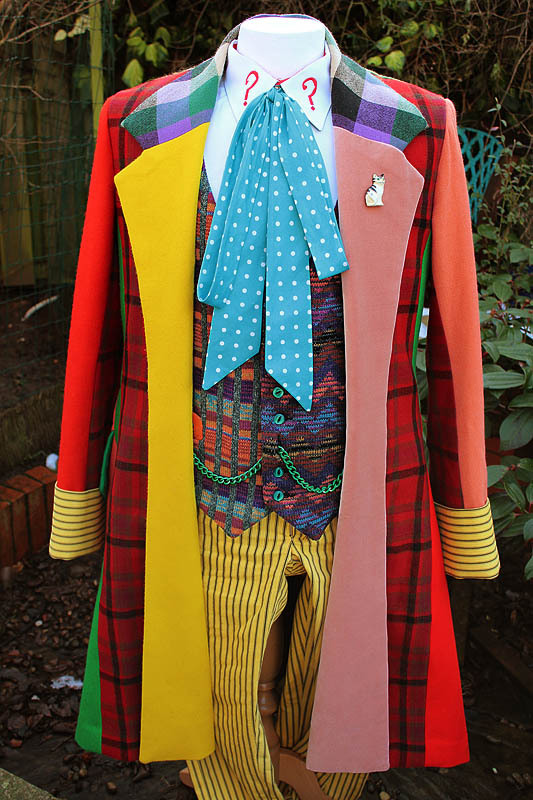 This Sixth Doctor costume is really brilliant. I am very impressed. It should look brilliant - its an ORIGINAL screen-used one (bar the cravat)!!!!! Any plans to make replicas of the coat? I've tried looking all over the internet, but can't for the life of me find one (or at least, a good one) anywhere. And I'm a big fan of it. The frock coat is a big project that will need lots of careful planning and work. As you can see we matched a few of the fabrics straight off - which was a boost - but there are some tricky ones in there that will take a little longer. . . .
One day maybe . . . one day . . . . I know which narrow back panel you're talking about (the one we thought was tartan), but I can't see the image there. I'd love to see that up close; I'd been watching a bit of Six lately and I always notice that strip of squares in the back. Ah the 6th Doctor's coat I feel rather as though it's the perfect cocoon of madness from which true genius can come from or perhaps I'm just too much of a seventh Doctor fan?